Which came first, the dragon or the egg? 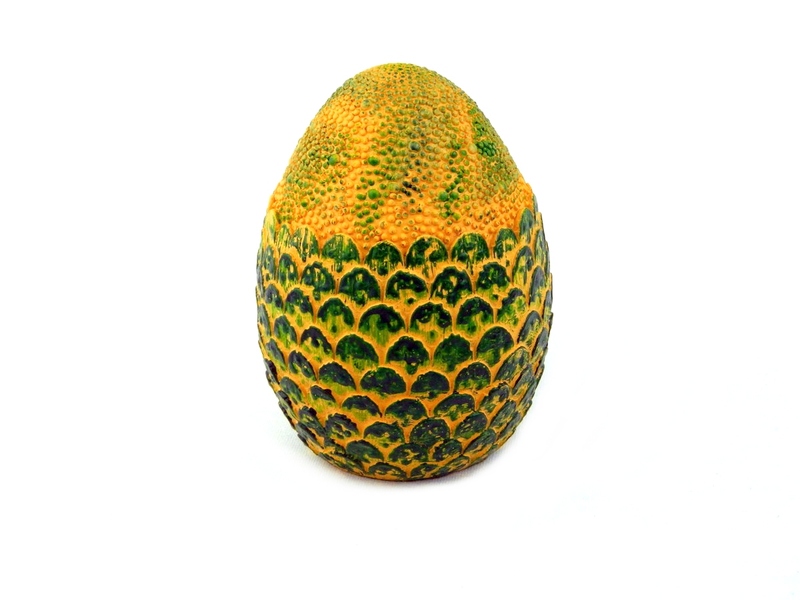 Toynk Toys has the answer with their latest in-house offering: Solid Resin Dragon Egg Prop Replicas! 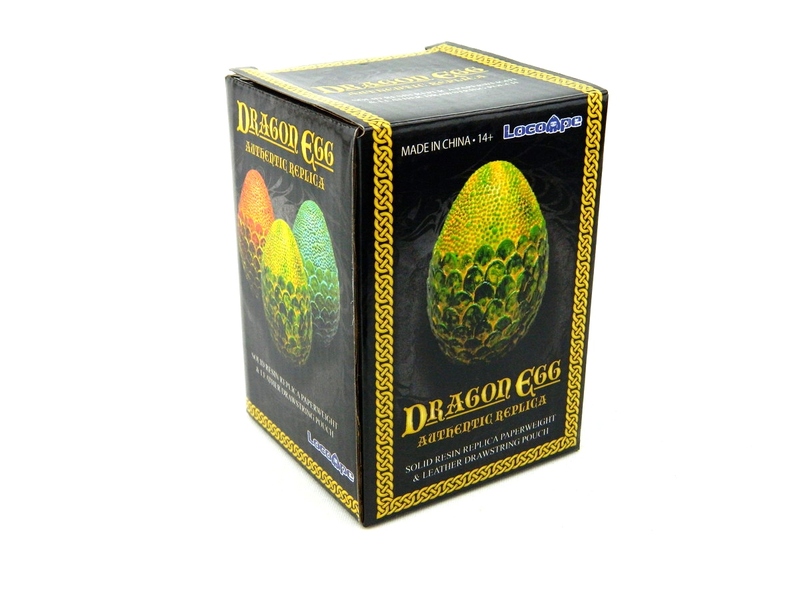 In-stock now at Toynk.com, the Dragon Eggs come in three attractive colors: red, blue and green. Each is priced at $29.99 with free shipping in the contiguous U.S.
As advertised on the pack, each egg comes with a fleece brown drawstring bag. 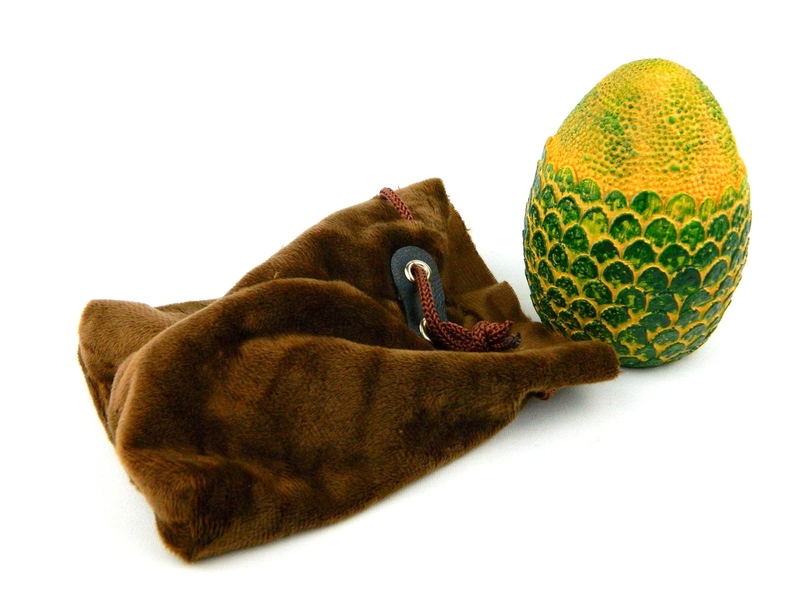 The egg actually comes stowed inside the bag when you open the box, providing the resin replica padded protection. I don’t see many people using the drawstring bag to tote their eggs around (they look much better on full display), however I appreciate the extra layer of sophistication the bag brings to the entire packaging presentation. One of the things I love about Toynk’s collectibles is that when they say “solid resin,” they mean SOLID resin. 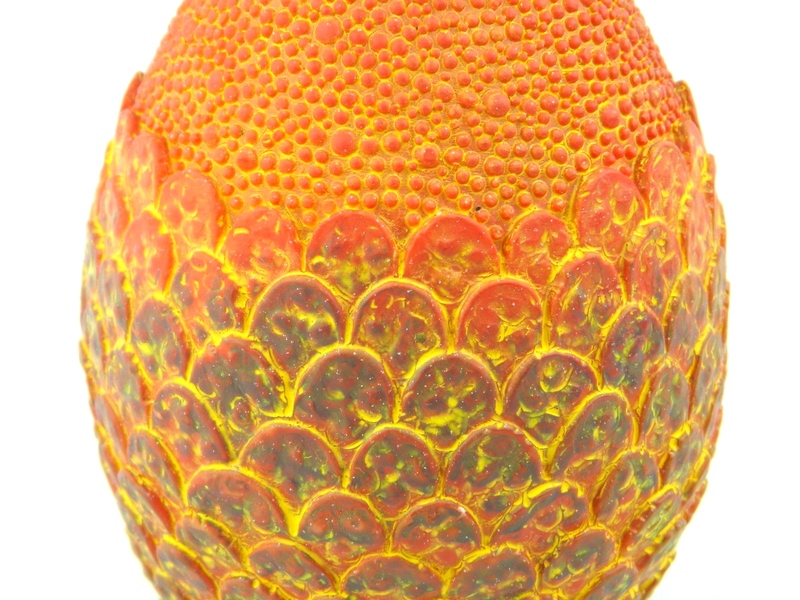 Like their Indy-inspired Golden Idol (read my review HERE), Toynk’s Dragon Eggs are very heavy, quality resin replicas; there’s nothing cheap feeling about their construction. Each egg is advertised as weighing over one pound, and I believe it. 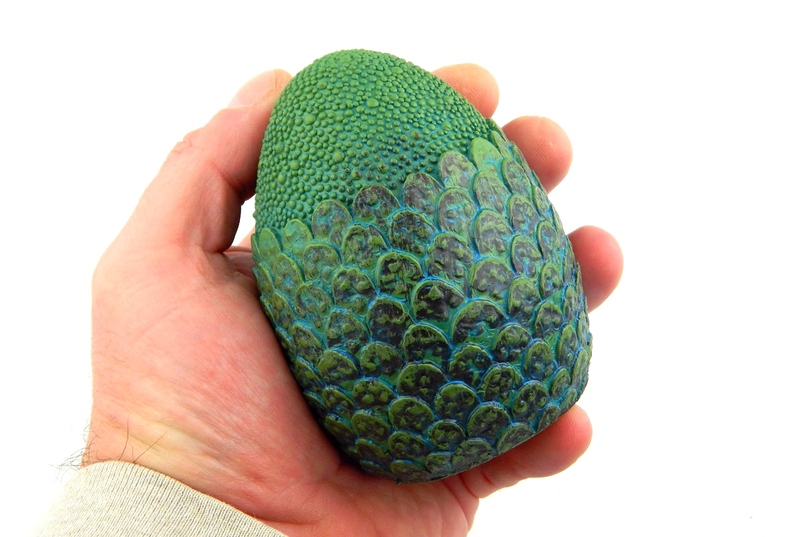 Dragon Egg paperweights, indeed. Fitting nicely in the palm of an adult hand, each egg measures 4.5-inches tall. Each egg makes for a striking desktop paperweight on its own, but their compact size allows them to easily be grouped together, looking awesome on shelf display. The hardest decision many collectors are going to have is picking a color. The paint work on these eggs is not very complex, but it is very effective. Each primary color really pops and the use of a secondary color, such as yellow on the red egg, does a wonderful job of emphasizing the main paint scheme. All three versions look fantastic, but if I had to pick my favorite, I’d go with red (because red dragons rule). With anticipation high for the epic conclusion of Game of Thrones next year (and there will be dragons! ), interest in fantasy collectibles is alive and well. 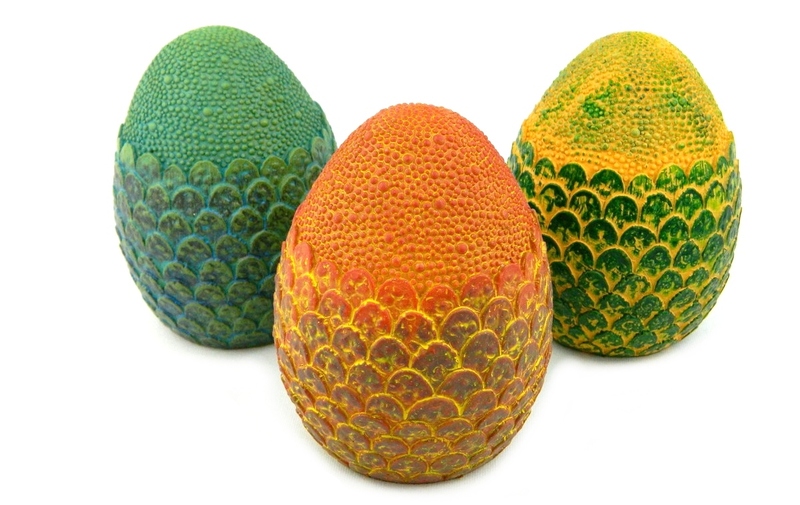 Toynk smartly taps the genre with this trio of non-licensed collectibles – Dragon Egg Prop Replicas that will please not only fans of the hit HBO show, but fantasy fans in general. With the holidays right around the corner, these eggs make a truly unique gift idea. All three eggs are available for purchase individually at Toynk.com priced at $29.99 each. For those that can’t decide which color to get (and want to save a few bucks in the process), a deluxe set of all three is also available HERE priced at $64.99! Coming Soon from Funko: Ronda Rousey Pop!